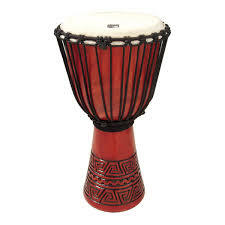 At the day-long singing and drumming retreat on Saturday, I failed to fully step up and confront cultural appropriation and lack of respect for the people whose drums were enriching our lives. In a circle of around 50, all of us but one appeared to be of European descent. Most of the drums were djembes, a drum from West Africa. There were also dumbeks, traditional to North Africa and West Asia (a.k.a. the Middle East); frame drums, which I associate with Celtic tradition although they are used in many cultures; and other drums I didn’t know. As we settled into the circle I noticed a couple women resting their feet on the head of their djembes. Drums are sacred in West African cultures and I had experienced drum teachers educating new drummers about not using a drum for anything but drumming. I was uncomfortable with the blatant disrespect for the drum and unsure what to do about it. Part of me wanted to address the women individually but it seemed presumptuous as I was not the drum teacher. I hoped the two retreat leaders would say something, but they did not. At the first break I thought of saying something to them, but there was a tattle-tale vibe to that. Plus by now we were well into the beauty and meditative state of the day and I wanted to enjoy letting my conscious mind unravel and fall into the sound and vibrations of singing and percussion. So I let it go. 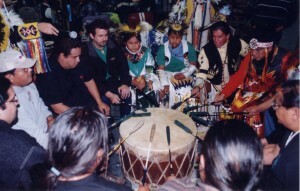 The second half of the day was built around a new drum, carried in and set up in the middle of the circle. It was a small Native American drum, the type that is suspended from a stand and played by several drummers at once with large padded drum sticks. The drum leader introduced the drum, talking about how it came to her and naming the man who made it. I kept expecting her to attribute the drum to a particular tribe or at least say it was a Native American drum. When it became clear that she wasn’t going to, once again I did not speak out, not wanting to interrupt the flow of the group settling into the ritual planned for the afternoon. Why did I not speak up? I realized at that moment another thing: at this circling of women and men to spend the day singing and drumming, a day that opened with prayer and gratitude, no one had called in the Coast Miwok ancestors and acknowledged this spot in San Rafael as on their traditional territory. This acknowledgement of being on Native American land at the opening of events is something I am used to and have made a commitment to myself to do whenever I am facilitating a workshop or speaking at a gathering. And I had not asked for this acknowledgement as we began. After we closed, I spoke with a friend who has been drumming in West African traditions for a long time. I mentioned my discomfort with the disrespect for the drum I had witnessed and how I wished the leaders had acknowledged the rich cultures the drums came from. She had not thought about any of it but immediately supported me in my concerns, suggesting I email the leaders. Instead, I went and spoke with the drum teacher. She was open and receptive and disappointed with herself for overlooking naming the cultural origins of the big drum. Also, she recognized her responsibility to remind drummers to be respectful of the drum. Still, I am uncertain about my actions at the retreat. I didn’t “interrupt” even though I often talk and write about the need to interrupt white supremacy. In the morning as we were settling in, it would have been so easy to go over and say something about feet on a drum and West African reverence for the drum, needing to respect the drum and the culture of its origin. Maybe I just wanted a day off from possible confrontation or anger. Yet I am well aware that people of color don’t get “time off” from dealing with racism. Later, after we were fully into the day, I didn’t want to disturb the flow, despite knowing that taking no action maintains status quo. I do not accept my excuses and reaffirm my intention to take the risk next time and step up. 4 Responses to "Stepping Up to Address Cultural Appropriation"
Thank you for this post. Especially great to read the part about acknowledging the people from the Indigenous lands that you are on. This is such an important step that hopefully will lead to more people thinking about what they can further do to work with those communities. This is a confusing issue for many… I teach music from all over the world but in particular African Music; drumming and singing, but I am not African. I have studied music and traditions with many teachers, many of them African, and have been encouraged to teach and pass on cultural gifts by them, in the hope that unity and healing can occur,which it certainly does. Is anyone being disrespectful or unkind? Is anyone or any culture being exploited? Is anyone being helped? Is respect developing? Are stereotypes and misconceptions being replaced with accuracy, with truth? Are people from all races and backgrounds welcome in the group? Are the music and the traditions being treated with respect? Is the source and inspiration of the music and traditions being acknowledged? all the best of luck to all of you working together to create healing and community. I believe that speaking privately to the leaders was the right call IF your priority is changing behavior. Being corrected in public – being shamed and embarrassed in front of others – is tricky territory most of us don’t handle well. We feel attacked and respond with defence. It can too often turn into rejection of the message. When our objective is to raise awareness and change behavior, we need to keep this in mind. Since it appears that your words were heard, these leaders will then be allies, share what they learned, and have much more impact that you alone. I also am sharing this on my personal FB page. I shared the picture of the Wildhorse Pow Wow drummers on my meditation FB page, OceanCrest. Thank you for sharing this, Judy. I appreciate your candor in this piece and am sure many of us have felt the same regret (and perhaps a little shame) when we have not spoken up in public when we’ve felt it was called for. By sharing these feelings, we can learn from one another and continue to move forward.